Yes I am taken very seriously in the world of fine arts. It’s the entire all-encompassing scope as the creator to relay my message that's in my minds eye. 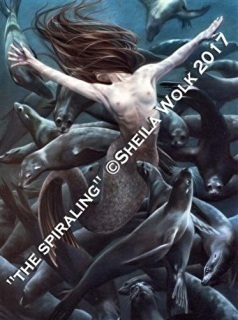 Once that is done, the audience is the visual owner at that point; the painting (interpretively) belongs to the world. The spectator can see what they want to see. You can put 10 people in front of the same painting and they will all interpret that painting differently; their imaginations take over where the painter has left off. If there is an emotion struck by the audience, then my job as an artist and creator is well done. This is very hard work, and then to know the business end to the arts is the second accomplishment to success. The Contracts, the Licensing, the Publishing, the Marketing, the PR, the communication skills, the meetings, all must also be understood and applied to everyday living as well. All this is inclusive in what I do to survive as an independent artist. 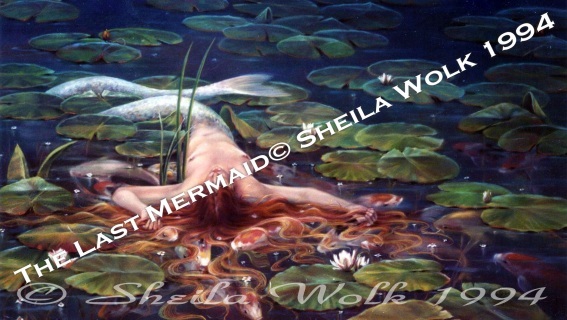 I am grateful that the public journeys into the fantasy world I am painting. 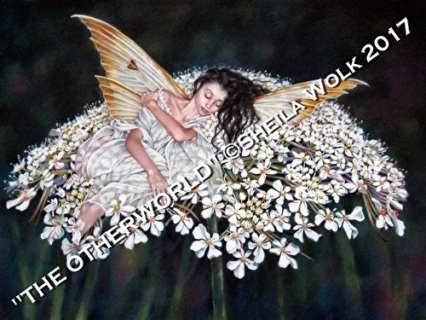 The fan mails I receive of so many stories telling me of happenings in their lives or souls when they looked into one of my paintings are an amazing reward to all my hard work! That's when I realize I am an accepted artist. The public has been touched by emotions, through my emotions in each piece. Below is a quick visual of what is in my store for sale. When contracting with many wonderful companies, I get samples of those products being manufactured which I have collected in storage rooms. So now many are being sold to make new space for new things. 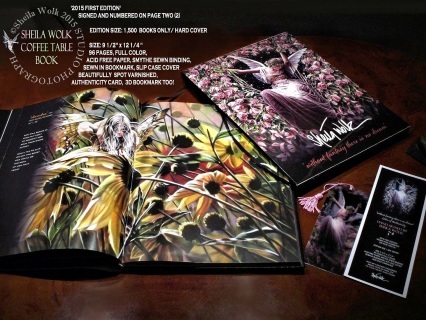 This is my first full Fantasy Art Book on my artwork solely dedicated to the last 20 years of my fantasy art paintings. 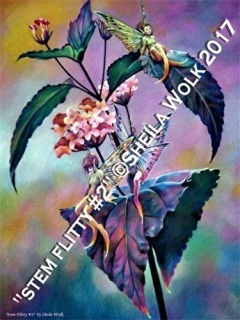 Before that I was a sports artist but retired in order to expand my imagination with my paintings. 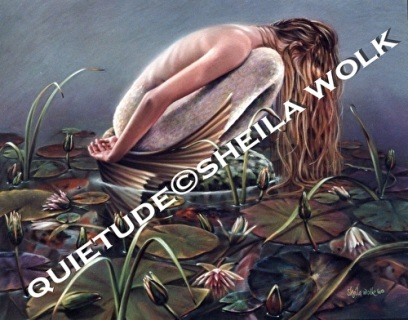 Included are many of my copyrighted poems, prose and stories that enrich the understanding of my visions. I hope you enjoy the journey I traveled through my life, and now my book! Hand signed and numbered inside book on page two (2). This book is delivered to you via USPS PRIORITY MAIL with tracking and insurance. 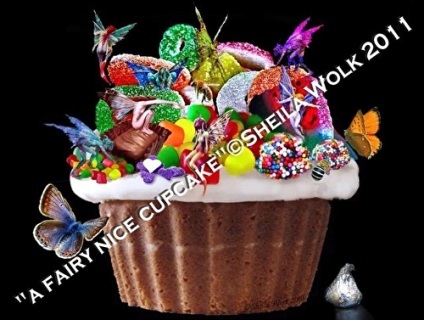 Your price is the $100.00 plus shipping, handling and insurance which totals $115.00. This means it is leaving here in MINT condition (with photographs supplied to you in detail for proof) and if anything happens to it in route to you by mail courier, you would need to file for full refund through the Post Office Insurance made available to you. Refund is available with this item when using your covered Insurance and you agree to these terms upon purchase. NY TAX INFO:Seller charges sales tax for items shipped to: NY*(8.85%). * Tax applies to subtotal + S&H for this state only. Two handles and felt bottom, so your tables won’t get scratched! 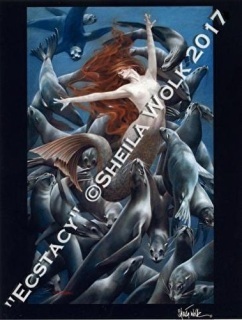 Selections: ''FIELD OF DREAMS'' ( fairy), ''METAMORPHOSIS'' (mermaid), ''GATEKEEPER'' (angel with roses) , ''ETERNITY'' ( sleeping mermaid), and ''SANCTUARY''( large angel seated). 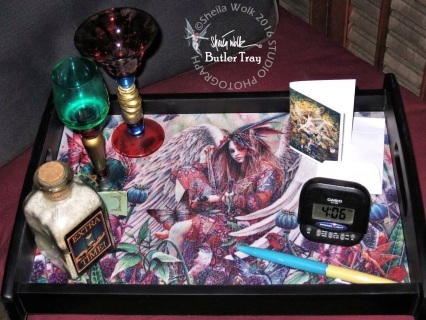 SHEILA WOLK'S "Butler Trays"- CHAMELEON!! 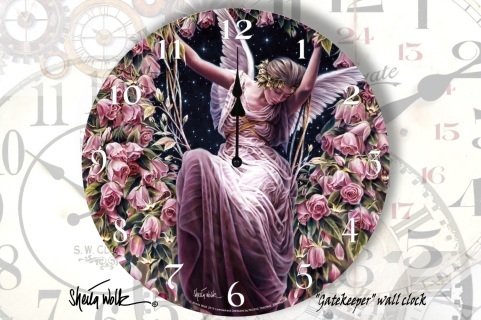 Selections: ''FIELD OF DREAMS'' ( fairy), ''METAMORPHOSIS'' (mermaid), ''GATEKEEPER'' (angel with roses) , ''ETERNITY'' ( sleeping mermaid), and ''SANCTUARY'' ( large angel seated). 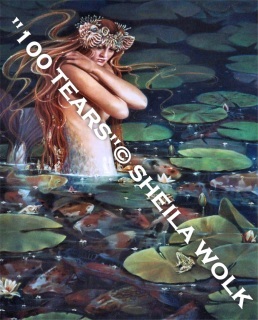 SHEILA WOLK'S "100 TEARS" FROM MY PERSONAL STUDIO COLLECTION~8 1/2" x11"
This is an original print that I have created in my art studio. Acid Free-will not yellow or crumble over time. 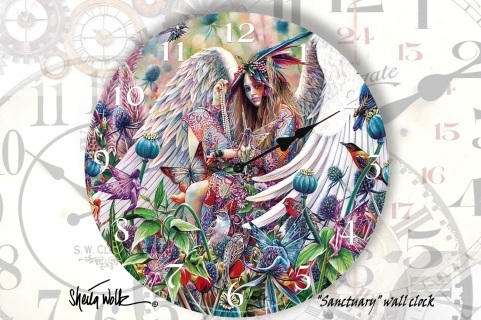 They are printed on Photo Supreme paper with a beautiful matte finish! 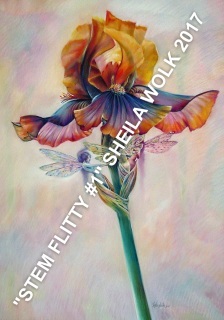 SHEILA WOLK'S "STEM FLITTY #1" FROM MY PERSONAL STUDIO COLLECTION~8 1/2" x11"
SHEILA WOLK'S "SPIRITUS" FROM MY PERSONAL STUDIO COLLECTION~8 1/2" x11"
SHEILA WOLK'S "MER PRESERVE" FROM MY PERSONAL STUDIO COLLECTION~8 1/2" x11"
SHEILA WOLK'S "CHAMELEON" FROM MY PERSONAL STUDIO COLLECTION~8 1/2" x11"
SHEILA WOLK'S "HORIZON'S PASSING" FROM MY PERSONAL STUDIO COLLECTION~8 1/2" x11"
SHEILA WOLK'S "STEM FLITTY #3" FROM MY PERSONAL STUDIO COLLECTION~8 1/2" x11"
SHEILA WOLK'S "WELCOME TO MY WORLD" FROM MY PERSONAL STUDIO COLLECTION~8 1/2" x11"
SHEILA WOLK'S "DREAM KEEPER" FROM MY PERSONAL STUDIO COLLECTION~8 1/2" x11"
SHEILA WOLK'S "ECSTASY" FROM MY PERSONAL STUDIO COLLECTION~8 1/2" x11"
This Print shows the entire painting which is reduced to 6 1/4 " X 10" on a black background with my name printed on the bottom and the entire print is 8 1/2" X 11"
SHEILA WOLK'S "QUIETUDE" FROM MY PERSONAL STUDIO COLLECTION~8 1/2" x11"
SHEILA WOLK'S "MY BUBBLE~- FROM MY PERSONAL STUDIO COLLECTION~8 1/2" x11"
SHEILA WOLK'S "THE OTHERWORLD~- FROM MY PERSONAL STUDIO COLLECTION~8 1/2" x11"
SHEILA WOLK'S "THE SPIRALING~- FROM MY PERSONAL STUDIO COLLECTION~8 1/2" x11"
SHEILA WOLK'S "IN BLUE~- FROM MY PERSONAL STUDIO COLLECTION~8 1/2" x11"
SHEILA WOLK'S "IGATEKEEPER~- FROM MY PERSONAL STUDIO COLLECTION~8 1/2" x11"
SHEILA WOLK'S "A FAIRY NICE CUPCAKE"~ FROM MY PERSONAL STUDIO COLLECTION~8 1/2" x11"
SHEILA WOLK'S "THE LAST MERMAID" STUDIO PRINT~ 8/12" x 11"~ GREAT SIZE TO HANG ANYWHERE! 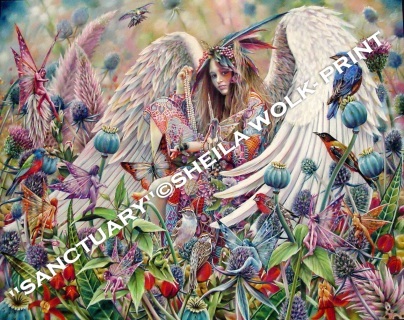 SHEILA WOLK'S "SANCTUARY" FROM MY PERSONAL STUDIO COLLECTION~8 1/2" x11"
8 1/2" x 11"This is an original print that I have created in my art studio. 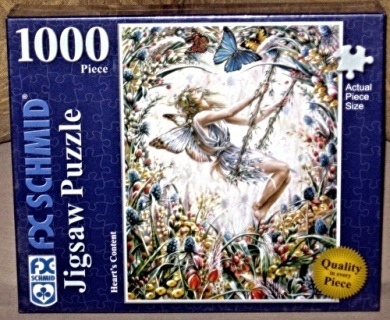 Jigsaw Puzzle 1000 Pieces NIB. 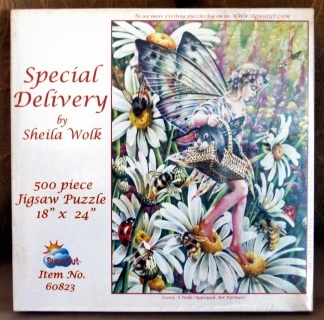 If you like fairies and fantasy this is the puzzle for you. Gorgeous colors and so many different butterflies. 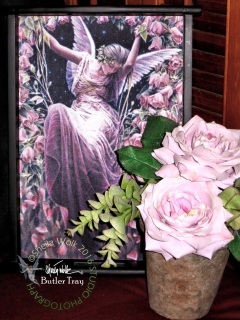 The winged fairy is delicate and beautiful. 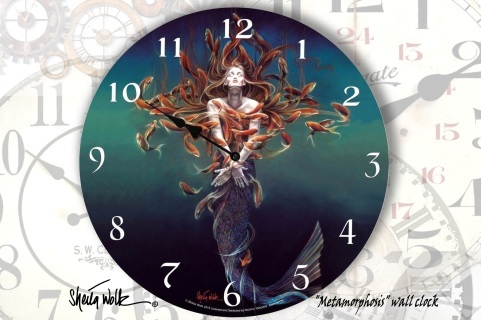 LARGE SIZE: 19-1/4" x 26-5/8" (48 x 67 cm). Puzzle will measure 15.5 x 23.5 inches ( 39.37 x 59.69 cm) when complete. 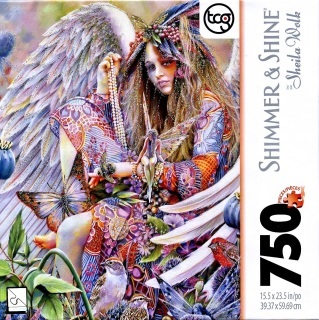 Sure-Lox introduces this 750 piece Shimmer & Shine Puzzle still factory sealed with artwork by Sheila Wolk dated 2015. This is a challenge for the person who loves to do puzzles. 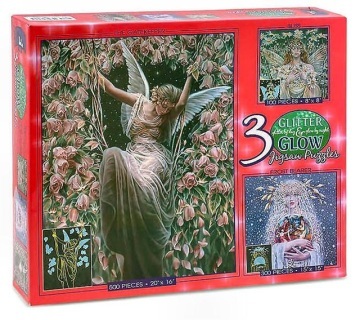 This Glitter & Glow Puzzle Set contains three jigsaw puzzles. Frost Bearer, 300 pieces measuring 15" x 15". 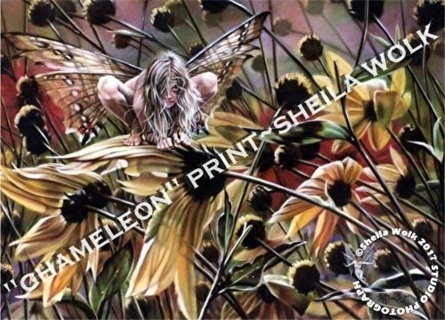 The Gatekeeper, 500 pieces measuring 20" x 16". 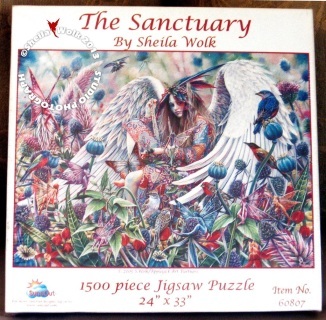 SHEILA WOLK’S “HEARTS CONTENT”-NEW SHIMMER SHINE PUZZLE-750 PIECES OF FUN AND PRETTINESS!!!! 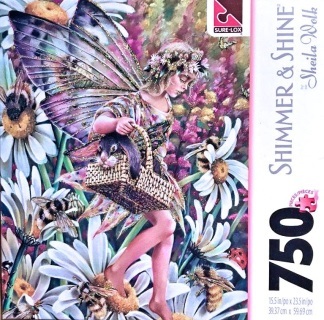 “HEARTS CONTENT”-NEW SHIMMER SHINE PUZZLE-750 PIECES OF FUN AND PRETTINESS!!!! 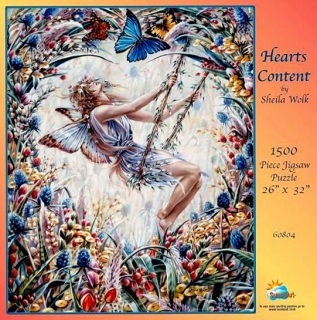 SHEILA WOLK"S "HEARTS CONTENT ~1500 PIECE PUZZLE ~by SunsOut CO. SIZE WHEN COMPLETED: 26" x 32"
May this wonderful puzzle bring health, peace, and happiness, into your heart and home...thank you! Finished puzzle size is 19.25" x 26.625"
May this wonderful puzzle bring health, peace, and happiness, into your heart...thank you! Manufactured by: FX SCHMID CO.
A gorgeous puzzle Manufactured by Sunsout Inc.
SOLD OUT ON THE INTERNET NOW, SO THIS IS A RARE ONE! 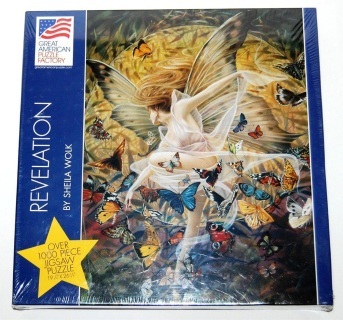 This is so much fun for the person who loves to do puzzles. into your heart and home...thank you! 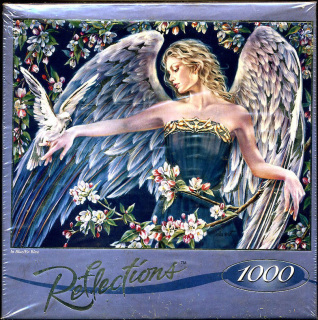 Reflections Puzzles have foil highlights that shimmer and shine. 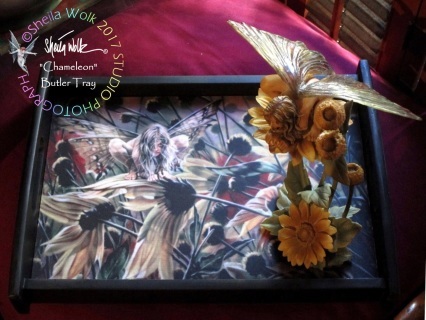 that adds glistening detail and depth to the original art, resulting in a gorgeous puzzle experience and a dazzling piece of art suitable for framing! May this gorgeous IN BLUE silver foil puzzle bring health, peace, and joy, into your life...thank you! ​.....Seller charges sales tax for items shipped to: NY*(8.85%). * Tax applies to subtotal + S&H for this state only. 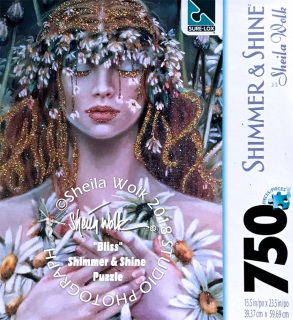 SHEILA WOLK’S “BLISS”-NEW SHIMMER SHINE PUZZLE-750 PIECES OF FUN AND PRETTINESS!!!! 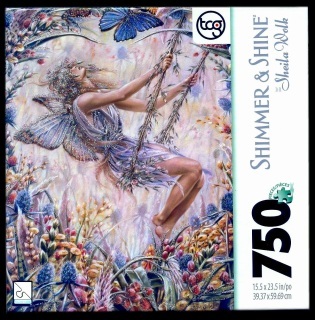 “BLISS”-NEW SHIMMER SHINE PUZZLE-750 PIECES OF FUN AND PRETTINESS!!!! 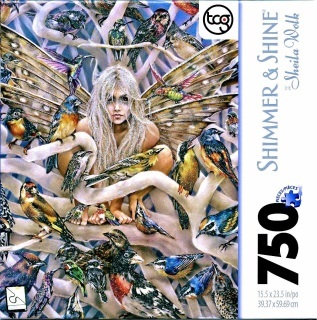 Sure-Lox introduces this 750 piece Shimmer & Shine Puzzle still factory sealed with artwork by Sheila Wolk dated 2018. NOTE:_____________Seller charges sales tax for items shipped to: NY*(8.85%). * Tax applies to subtotal + S&H for this state only. 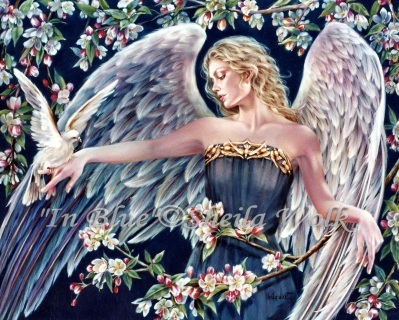 · to create a Dreamscape of enchanting beauty and fabled Majesty. · Sure-lox puzzles have fully interlocking and unique shaped pieces that are designed to make puzzling more fun! · Puzzle measures 23.5 x 15.5 inches ( 39.37 x 59.69 cm) when complete. May this puzzle bring health, peace, and joy, into your home...thank you! full effect of " Once Upon A Dream"....thank you. 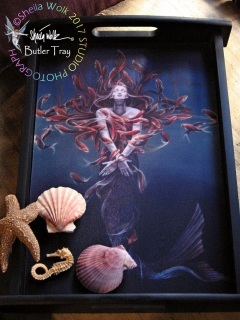 This is a limited edition (3500) signed and numbered bejeweled fairy trinket box inspired from my painting. a pendant attached to an 18" gold toned necklace. Included with this piece is a small picture copy of the original art. Each piece is numbered. 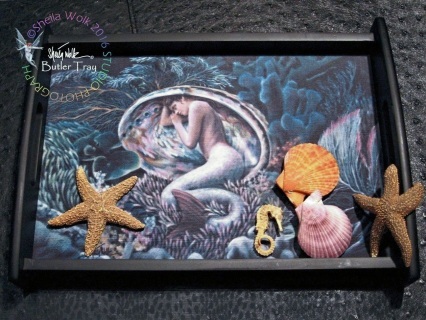 This jeweled trinket box is based upon the painting "Once Upon a Dream" .The box has a hinged opening and secure magnetic closure. 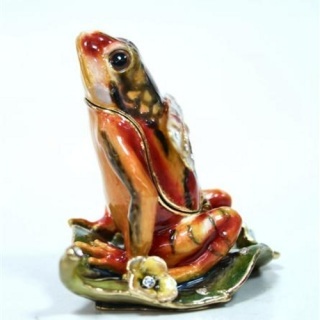 The box is made of pewter and hand painted in pearled enamel. 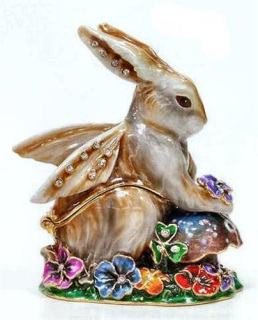 The opening rim of the box is trimmed in gold and its side is beautifully decorated with Austrian crystals. The interior of the box is finished with glossy enamel. 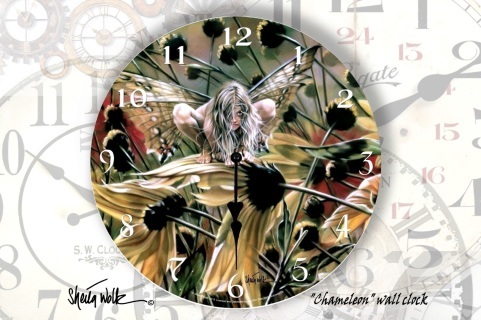 This is a beautiful piece of quality art that would make a wonderful gift appreciated by anyone who receives it or to keep on display in your home. The item comes with a satin lined gift box ready for gift giving. 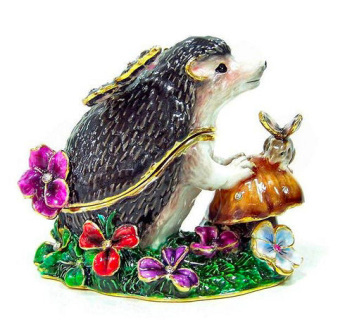 May this wonderful trinket box bring health, peace, and happiness, into your home...thank you! 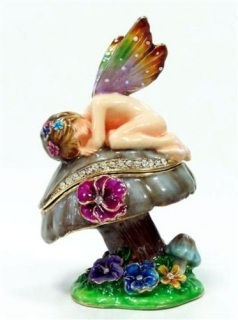 This is a limited edition (3500) signed and numbered bejeweled fairy trinket box inspired from my popular painting. The figurine comes inscribed with my signature of authenticity and includes a pendant attached to an 18" gold toned necklace. 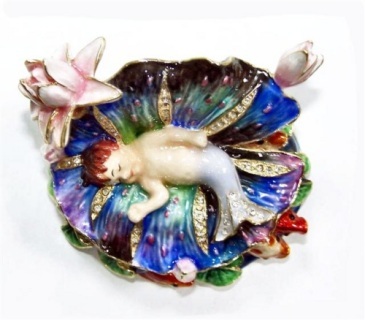 This jeweled trinket box is based upon the painting “THE CRADLE”. 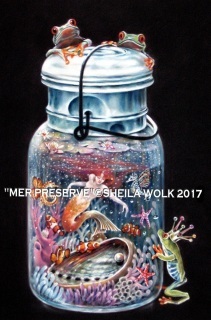 The mermaid is napping in a bejeweled seashell inside the top half, and fish swimming around on the bottom half of shell. The box has a hinged opening and secure magnetic closure.